Posted December 18, 2017 by Diane & filed under My Books, On Scotland. The great medieval castles of Scotland have always inspired me and helped me create my fictional worlds. In this series, I’ll share pictures of castle bits that have directly led to specific scenes in my novels. For this post, let’s talk castle stairs. I always knew that castle stairs were narrow, and spiral, and designed to make it hard for right-handed sword-bearing invaders to go up while right-handed sword-bearing defenders were going down*. I had a battle scene I was writing near the end of The Mad Wolf’s Daughter that I’d set in a hallway to give my characters room for dramatic sword moves. 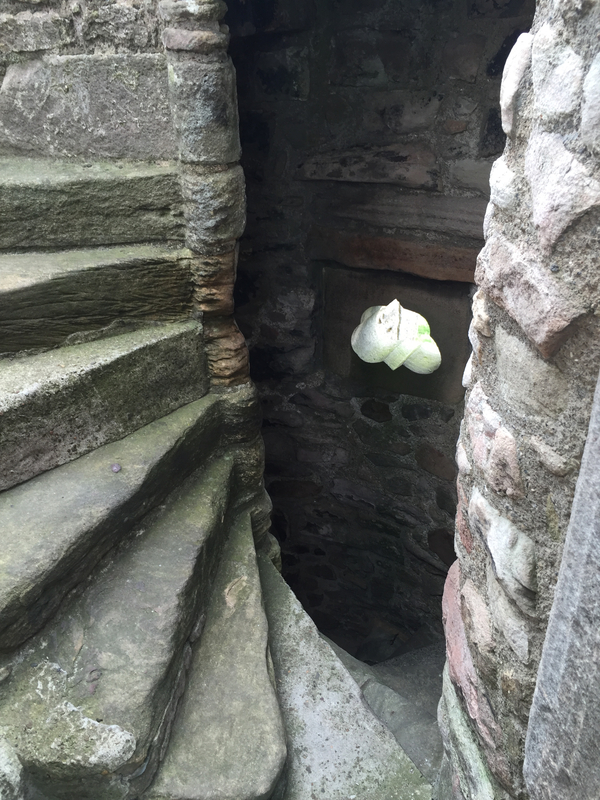 But when I saw these stairs at Craigmillar Castle in Edinburgh, I realized that I was missing an opportunity. You can find that scene late in the book, and you’ll know the stairs it came from! Many thanks to Historic Scotland Environment for maintaining and keeping public so many inspiring properties like Craigmillar Castle. * Apparently, lefties faced discrimination during medieval times, and might even have been charged with accusations of witchcraft, so I think it’s safe to assume that people training to be knights would be taught to fight with their right hands. That said, anyone who could fight with the left hand (as does Drest, the protagonist of The Mad Wolf’s Daughter) would have quite the advantage! But religion entered into this discrimination, and, with the holy vows knights took, most knights probably fought the way they were trained.